Address: 8100, Várpalota Hunyadi Mátyás tér 1. The annexe, where the exhibition takes place and the exhibition itself was reconstructed and done by Várpalota Coal Mines Company. The exhibition is on 275 m2 and comprises four rooms. 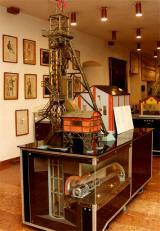 The exhibition takes place in 4 rooms of the Thury Castle and embraces the history of coal-mining in Várpalota, which started in 1876.In the first room there is a marble table with the date and reason of the foundation and also appreciation of those who contributed to the successes of 100 years. On the wall two painting shows the panorama of Várpalota in 1905 and in 1976. Also on show here the wooden statue of two miners made by Senior István Szabó, who has Kossuth Award. The memorial tablet in front of the entrance lists the name of those miners who died during work at Coal Mines of Várpalota Company.